Introducing- the Hooters! quilt. So christened by Lynz, due to all the owls in the centers of the blocks. This was a lot of fun to make, making wonky blocks is pretty stress-free, no measuring to speak of, just add strips and whack off the excess! Big thanks to QuiltDad, John, for all his great instructions and leadership! Do you like it? Think it could stand a bit more color? rofl It's pretty big, about 70 x 84". I did that swoopy quilting and it was HARD to do on this big of a quilt, shoving 95% of the quilt thru the throat of the machine just stunk, it was murder on my neck and shoulders and hands, even with my grippy gloves on. So, quilters- save the swoopy quilting for smaller quilts, like my zigzag quilts, which were 40 x 48" or something like that. Love it! I wish I had such a lovely set of Hooters! LOL! Fan-bloody-tastic. My favourite bit, I think, is the name on the back. *grins* Inspired, missus!! And the quilting was worth it, even if yer an auld crip, now! That is a great looking quilt! I bet your neck and shoulders were sore after all of that. I like making baby quilts and small wall quilts for that very reason. love everything about it. I have that same fabulous owl fabric but haven't been willing to cut it up. love the colors and blocks and that back is wheeeeeee!!! congrats on a great quilt. I love this quilt! Absolutely gorgeous! Honestly, the name is what brought me here. Hooters! Hilarious. I completely love this quilt! 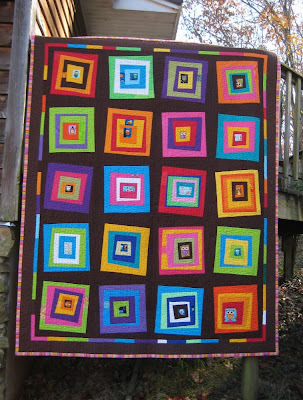 This quilt looks great and I really like the narrow multi-colored inner border - perfect.